iPad Edition of the former #1 paid iPhone application – Live Cams! The ORIGINAL public/private camera viewer with the ability to pan tilt and zoom supported devices! ✪ See the other side of the world in real time! 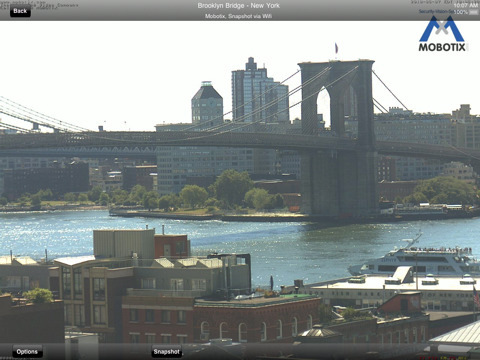 Live Cams is a JPEG/MJPEG based video viewer for IP cameras and webcams. It supports dozens of IP camera models from major manufacturers like Canon, Sony, Panasonic, Trendnet, Linksys, Toshiba, Vivotek and more! Add your own cameras into the app for viewing on 3G or Wifi and enjoy PTZ controls for supported models. The application stores information locally and nothing is ever posted to a server for others to hack. You may enter an unlimited number of cameras, either your own or public cameras found on the internet. NOTE: Works best on Wifi connections. 3G connections support limited bandwidth and framerates will be reduced. Live Cams does not support H264 or MPEG video. Devices must output JPEG images or MJPEG streaming video to be compatible. Webcams on Mac and PCs require additional 3rd party software (like webcamXP and EvoCam). Audio is not currently supported for any models but may be added in the future. Over 3000 public cameras found on the internet are included for free as samples to view for various models. Image quality and responsiveness is based on camera settings by the owner and the network load (# of users per camera). Cameras may be removed or disabled from the list at any time and are not under control by the author of this application. Public cameras found in this application are all available freely online on various websites. Performance and availability fluctuate from day to day. Cameras may be taken offline by their admins at any time. We are charging for our private camera engine and not for the sample cameras included. Want your business/resort camera included in the public samples for everyone to see? Contact support and send us the details! We would love to receive screenshots of yourself in front of some of the public cameras holding a “Live Cams for iPhone” sign. Acceptable screenshots will be used as promos in iTunes!